US President Donald Trump speaks at the National Federation of Independent Businesses 75th Anniversary Celebration at the Hyatt Regency hotel in Washington, DC on June 19, 2018. 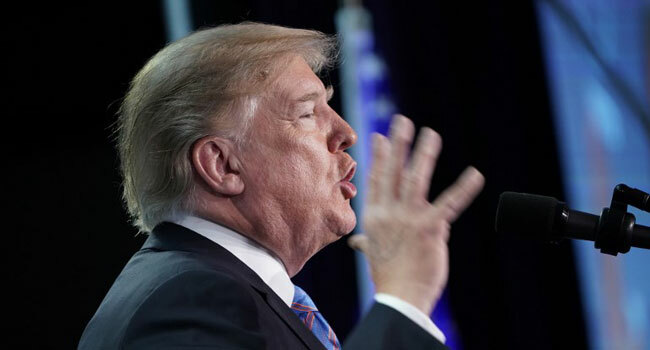 President Donald Trump on Tuesday defended the “zero tolerance” policy leading to thousands of migrant families being split on the US border as the only effective way to fight illegal immigration. US officials say more than 2,300 children have been separated from their parents or guardians since early May, when the administration announced its push to arrest and charge anyone illegally crossing the US-Mexico border, regardless of whether they were seeking asylum. A chorus of critics — rights groups, Christian evangelicals, former US first ladies and some within the president’s own Republican party — are demanding an immediate end to the family separations. Hammering home the need to combat smugglers who he said “game the system,” Trump accused the media of helping human traffickers. “Those who apply for asylum legally at ports of entry are not prosecuted. The fake news media back there doesn’t talk about that,” he charged. Trump was headed later Tuesday to Congress to huddle with Republican lawmakers, many of whom are deeply uncomfortable with the separation policy. The president has accused Democrats of provoking the crisis by blocking legislation to combat illegal immigration. “We want to end the border crisis by finally giving us the legal authorities and the resources to detain and remove illegal immigrant families all together and bring them back to their country,” he said. The Republican-controlled House of Representatives is expected to consider two immigration bills. One is a hardline measure favoured by conservatives, and the other a compromise bill — which the White House has signalled has Trump’s support — that would end family separations, protect so-called Dreamer immigrants brought to the country as children, pay for boosted border security and curtail legal immigration. Tuesday’s Republican huddle will be closely watched, in part to see whether any lawmakers directly confront the president.